It has been a busy week here! 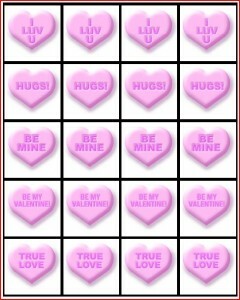 I was able to squeeze in a little Valentine’s Freebie though! 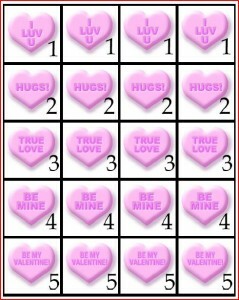 I made this Conversation Heart Math Game. Ok, ok….you are probably thinking “Um…aren’t you a SPEECH therapist? Why are you making a MATH game?” Well I have used a couple different variations of games in my therapy sessions that require math skills and I wanted to make my own version. Most of the games that I have played involved addition only, and I wanted to make a fun game that could target addition, subtraction and/or multiplication all while working on speech and language skills also. I personally would probably use this game in an articulation group, but it could be used in any group. Obviously this can also be used with children primarily to work on MATH practice also for those of you who are Regular Ed teachers, Special Ed Teachers, homeschooling or looking for fun activities to supplement your child’s education! Print out one copy of pages 1-3 and cut out the cards. (for a large group, you could print out two copies). Have children pick two cards from the number pile, and one from the math symbol card pile. Have the children take the cards and create a math problem and find the answer. Have the children keep track of all the answers to their math problems and have them add them together for points. After they are done, they can return the cards to a discard pile. The first one to a set # of points OR the one with the most points within a time frame is the winner. Tips: If your students/child is only working on one math concept or two/three concepts you can print out extra symbol cards and make the symbol pile whatever symbols you want to target. For speech pathologists: To use this game in therapy (I have used a similar game and the kids LOVED it!) there are a couple ways to use it. You can have your students practice their goals and then pick their cards OR you can have thm pick their cards, do their math problem, and then have them say the number of target words in their answer (i.e. they make the math problem 4+5=9 and they say 9 words with their target sound). I have supplied you with extra “blank” cards so that you can make the game even more custom. be creative! 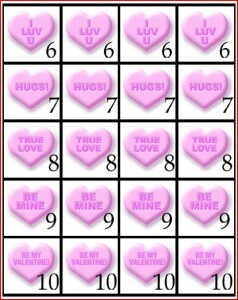 Use bigger numbers, add a “divide” option, Add cards like “broken heart” that when picked erases the players WHOLE score! If you are an SLP you could print them out and write target words on them! Have fun! Thanks for this great idea – I don’t have kids old enough for math but I can use some of it for memory games (match, etc.). Thanks! !